Dr. Guerra has been a part of Family Eye Care since 2011. Dr. Guerra is a Native of the Central Valley and grew up in Selma, California. She attended U.C. San Diego and received her Bachelor of Science degree in biology in 2007. She went on to attend the Southern California College of Optometry, where she earned her Doctor of Optometry Degree in 2011. 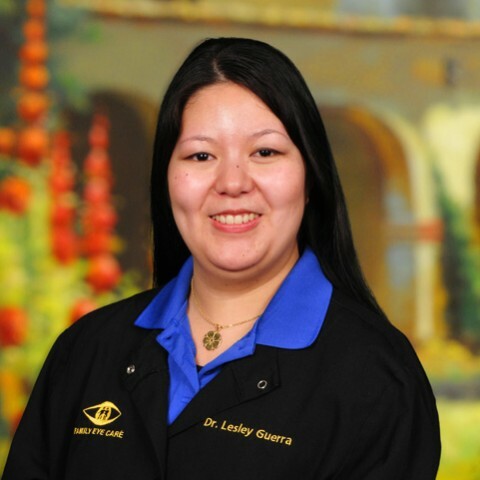 Having accomplished her goals, Dr. Guerra is excited to be practicing optometry at Family Eye Care and providing excellent services to the local Community. Dr. Guerra completed her clinical rotations at the Naval Hospital Lemoore, the Veterans Health Clinic in Sierra Vista, Arizona and the Hu Hu Kam Native American Memorial Hospital in Sacaton, Arizona. She is a member of the California Optometric Association and the American Optometric Association. Dr. Guerra is certified by the National Board of Optometry in the Treatment and Management of Ocular Disease and certified to treat glaucoma.